Spirituality, #healing, #johnnie calloway, #mental health, #ora nadrich, #says who? Join Johnnie and Ora as they explore how the Says Who? method can help address fear by building your courage. We all have fear! So many of us also let that fear hold us back. We can too easily or too often tell ourselves things that keep us in a state of fear. Johnnie shares some of his experience of relying on stimulants (as an addict) to get that false courage. Using Ora's Says Who? method, you can find the real courage and effective healing vs something that continues to tear you ... See More apart. The "Says Who?” method can be a practical tool to help dispel the energy that gets in the way of healing. 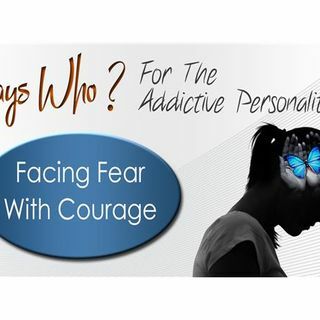 Through this series of conversations, they will share a powerful combination of practical principals and usable tools to alter the thoughts that drive the addictive personality. They will invite questions from their listeners and feature shows that address those questions. Johnnie and Ora believe that by bringing Ora's "Says Who?” method along with Johnnie's ACIM and 12 step experience together they can save their listeners a lot of pain and time in their pursuit of healing.